Black Diamond makes some of the best climbing and ski gear out there. Their quality of construction and attention to detail rivals no one. On top of that, their commitment to the outdoor industry and culture is paralleled only by Patagonia in my eyes. They give money where needed and volunteer to save climbing areas. They test product in their own back yard and employee dirt bag climbers and seasonal ski bums. A great company for sure and it is best represented through their product. The Stinger is Black Diamond's newest offering in the ice climbing category. This new crampon is radically different from anything they have done before and it combines all the best features of the Cyborg, but improves on overall fit, function and aggressiveness. This new crampon offers new geometry as well that improves efficiency when kicking and edge hold on mixed terrain. Mike is gonna hate this, but this is probably the best crampon I have ever climbed in and one of the best looking. From the replaceable monopoint to the new Electric Green ABS plates, I can't get enough, this crampon is sick! Whether using it on ice or rock, it just feels solid and performs extraordinarily well. The first radical difference you see from the new Stinger is the new geometry. The front point is unchanged, which is terrific because it means you can stock up on Cyborg/Stinger front points and using them on either crampon. The secondary points, however are much different than the Cyborg and are much farther forward and extremely aggressive with the new serrations. They grab ice very well and increase the purchase you get increasing overall stability. The overall curvature of the crampon is another difference which makes the Stinger a little more agressive. This increases the feel of the crampon on rock and makes it a little more versatile. Honestly it feels like a rock climbing shoe because of the dexterity the curvature allows for. 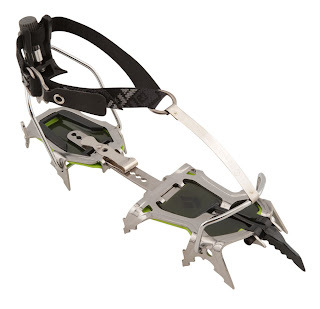 Overall I really believe this is one of the best crampons out there. A fixed monopoint and improved geometry has made me retire my Cyborgs. Plus the green ABS plates are a way better color for making you look good! Really though, whether I have been on a thin pillar or a crimpy face the monopoint has performed flawlessly and the agressive secondary points really bite into the ice. Comparatively this crampon is heads above the competition in aggressiveness, fit and comfort. If you are looking for a new pair, I highly recommend this crampon for replacing your old faithful set at home.